Not even the rain could dampen the spirits of the hardy that turned out for this fast and decepitively hilly sportive. 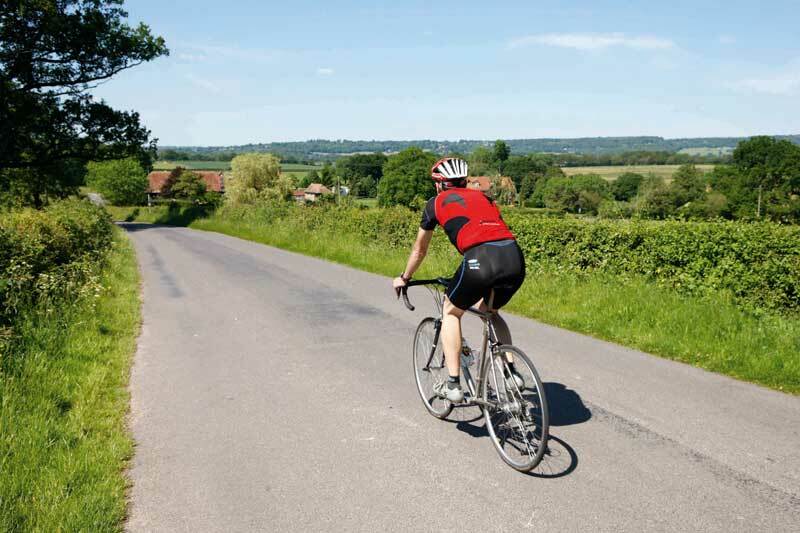 The Reigate Southern Sportive is the third in a series of rides based in the South East, taking in either the North or South Downs. With 3 different distances to chose from and taking in the beautiful scenery that the area has to offer few were left disappointed. From the word go the course criss-crosses east through the archetypal English hedgerows and is soon out onto the quiet undulating roads of Surrey, East Sussex and Kent, hats off to the organisers who managed to get a 86 Mile sportive iaround on of the busyiest part of the country without hitting to many main roads, the quiet traffic was one more thing that added to a great sportive. Rolling out along flat lanes for the first 40 km or so of the ride the legs get a fantastic warm up before heading into the North Downs past Heaver Castle and into the Sevenoaks Weald before coming back via the local ‘big climbs’ and highest point of Kent, Ide hll and then Toys Hill. The ride which is by no means epic in distance or climbing turned out to be a fast one for the fitter riders who took part, with nearly 30% of the full distance participants setting a gold standard and the winner averaging over 22.5 mph. Despite the event selling out fast , the overnight storms and torrential rain proved to be so off putting to some that only just over half started, however those that did start were rewarded eventually with some calm conditions and even the odd bit of blue sky. One thing that the weather couldn’t dampen was the atmoshphere with a great camaraderie between the riders, this was all helped by the superb organisation and support from the local hosts Redhill CC. Running events is always a nervous affair, with so many things to plan, check and control. but one thing you can’t control is the weather. So when I woke on Sunday morning to the noise of thundering rain bouncing off the pavement outside my heart dropped. Beside the obvious new safety issues to contend with there was the obvious fact that riders would be waking up and looking out there windows at the same time. Well the day turned into a day of two riders. The ones that looked out and said “well its raining but to heck, it might bet better” and those that looked and then rolled back into bed. Those that did turn up were greeted by a strong sun breaking though and a very unexpected great days riding. Other must have kicked themselves for not getting their bikes out that morning. So at the finish there were a lot of happy faces and a great buzz from all the riders that in the end had a great day and quite rightly felt truly proud of themselves. Maybe there is a lesson here? It was a great route! 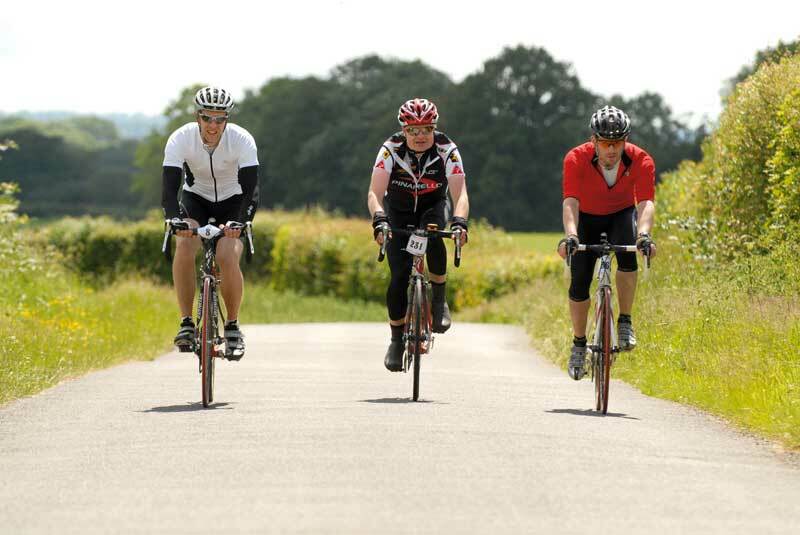 We do a lot of sportives and this one was really well organised and well signed. The last feed could have come a bit sooner though. We were really lucky with the weather after last nights’ storm too. A great day out, we’ll be back next year for sure. I really loved it! It was our first sportive today and we were amazed at the number of hills, there was one after another after another. It was really tough. I’ll definitely come back next time, I really enjoyed it! It was a really nice ride, the hills were all quite challenging and it was great that the ride was all on quiet lanes. It was a shame that we didn’t get to ride with many other people though as we set off quite late. Oops! Being woken up at 6am by an enormous thunderstorm overhead is probably not the best way to wake up on the morning of the longest ride you’ve done all year, but that is unfortunately what happened to me. The drumming of the torrential downpours outside kept me from nodding back off again so I reluctantly got up and considered knocking this ride on the head. Thankfully I didn’t and by the time I rocked up at the car park in Reigate the sun was shining and it looked like it would be a good day after all. We were one of the last small groups to roll out from the HQ and were soon into the lanes into East Sussex and over towards Hever Castle. Soon enough the group splintered and I was left riding with just my friends for company. The route kept to the minor roads and we able to ride along chatting without constant disruption from cars, which makes a nice change in this part of the world, and although I do a lot of riding in this area I found a lot of great new roads to come back to. The first feed came just in time as I was getting pretty hungry and some tasty flapjack and banana was gratefully recieved. The second half of the route was much hillier than the first with passes of Ide Hill and Toys Hill coming in short succession. A couple of other big slogs followed before my legs started moaning and I was quite glad to finally roll back into Reigate some 5 ½ hours later!